One of the most problematic areas of workers compensation coverage involves independent contractors. It is indeed ironic that tradesmen in high risk occupations (construction, landscaping, mechanical trades, trucking) often find themselves without workers compensation coverage because of their independence. In many (but not all) states, independent contractors are precluded from securing workers comp insurance. When these people are seriously injured, often their only recourse to indemnity and health benefits is to claim an employment relationship with the general contractor operating the site where they got hurt. The GC will state that, no, this is not my employee; I don’t control the work. The independent contractor, content with his or her status until the injury, now tries to claim that the GC controls the work and hence, there is an employer-employee relationship — and the workers comp coverage that comes with it. In July of 2004 the MA AG issued new requirements for independent contractors (M.G.L.c.149 sec.148). The new regulations contain strong, unambiguous language creating a default assumption that “independent contractors” are in fact employees, unless three explicit criteria are met. In other words, the burden of proof is now clearly on employers/GCs to prove the independence of subcontractors. In the absence of such proof, the subcontractor is assumed to be an employee. As a result, insurance carriers will routinely add the 1099 numbers from undocumented “independent contractors” to the GC’s payroll for calculating workers’ compensation premiums. The new standards are more stringent than the standards promulgated by the IRS, the Fair Labor Standards Act (FLSA) and even MA common law. 1. The worker is free from the presumed employer’s control and direction in performing the service. This standard is similar to those of the IRS and FLSA. Activities must be carried out with autonomy and independence. Contractors provide their own tools and materials and use their own approach without instruction or supervision. They determine their own hours. 2. The service provided by the worker must be outside the employer’s usual course of business. In other words, if the “independent” contractor is in the same trade as the employer’s own workers, there can be no determination of independence! Hence, overflow crews are not independent unless you can document that they carry their own insurance. 3. The worker must be customarily engaged in an independent trade, occupation, profession or business of the same type. The contractor must be in an independent business enterprise, working for others, truly working on his own. There is an additional and, to my mind, rather scary dimension to the new regs in MA. In addition to the unambiguous wording creating a presumed employer-employee relationship, the regulations open the door for lawsuits. Once it has been determined that the “independent contractor” is in fact an “employee,” the employee you did not know you had can sue you for violation of any number of worker rights you mistakenly thought did not apply. Violation of laws on discrimination. As I read it, it would almost be impossible not to be in violation of one or more of these statutes. Why would you track presumably “independent” contractors to this level of detail? The managing of independent contractors and sole proprietors has become a very high stakes game — not just in Massachusetts. So how can you protect yourself? Ideally, all of your subcontractors should be incorporated and should carry a full line of insurance coverage, including workers comp (where available). GCs should require that subs and independent contractors provide certificates of insurance with specified levels of coverage. For contractors operating in MA, all subs, including independent contractors, should be required to carry their own workers comp insurance. Certificates of insurance should be carefully tracked. Secure original certificates (not copies) and make sure the coverage is up-to-date and maintained from year-to-year. If your subs and independent contractors cannot provide this documentation of insurance, or if the certificates have expired, do not allow the subcontractors on the job site. If they begin working without insurance documentation, you are at immediate risk for assuming liability as their employer! At first, you may find resistance to these new and tougher standards, but once established, they will simply become a routine of the business day. On the other side of the equation, people working as independent contractors and sole proprietors should secure their own disability coverage, either through workers comp (if available) or through conventional disability insurance. You need to protect your livelihood! This is a complex issue well beyond the scope of a single blog. When I “Googled” “workers compensation + independent contractors” I had nearly 2 million responses! We will certainly revisit this issue in the months ahead. We’re big believers in employers committing to a total safety culture. If management can aim for a zero quality defect standard in a manufacturing process, why not hold to the same high standard for preventing “defects” to people? Are a certain number of injuries considered acceptable? Are worker injuries an inevitable part of doing business? We don’t think so, but occasionally we meet employers that do. When we talk to the “some injuries are inevitable” employers, we can’t help but wonder if they accept the same philosophy in other aspects of their lives. Would they find it acceptable if a certain number of injuries occurred to guests in their home? Or would it be acceptable if they got food poisoning in their favorite restaurant every now and again because accidents are inevitable? Not very likely. In case you haven’t noticed, the Insider cannot resist conundrums. We like to explore the ragged edges where conflicting views of reality play out their destinies. Which leads today to the interesting topic of volunteers. Are volunteers ever considered employees for the purposes of workers compensation? Are employers liable for the actions of their volunteers, just as they are for the actions of employees? This blog was triggered by a recent case in Wisconsin, where a volunteer for Christ King church was delivering a statue of the Virgin Mary to a parishioner. In her haste to do the good deed, she ran a redlight and crashed into the vehicle of one Hjalmar Heikkinen, an 82 year old barber. Heikkinen suffered permanent paralysis. In the perennial search for justice (and deep pockets), his attorneys included the church in his suit, under the theory that the volunteer driver was actually their “employee.” It’s basically the same legal principle that says a private delivery business can be held liable for one of its employees who causes a crash while driving for work. Plaintiff attorneys zeroed in on several lines in the church’s insurance policy, which indicated that volunteers doing church work are explicitly covered. Church attorneys noted the Legion of Mary meets and conducts its business without church guidance, but the other sides’ filings said the Legion of Mary was chartered at Christ King in 1968 with the help of a parish priest and noted the group was listed in several church publications. At this point, the jury has awarded Heikkinin $17 million. How much personal liability coverage do you suppose the volunteer had under her auto insurance? Is it any wonder that the plaintiff attorneys sought to call in a higher authority? Some states recognize the rights to workers compensation for volunteers, especially when it comes to volunteer firefighters. Some states, such as California, give employers a choice of whether or not to include volunteers. The University of California at Northridge has opted to cover volunteers for work related injury, even though they are not required to do so. I think it’s the right choice, given that it probably doesn’t cost them anything to do it. Because comp premiums are based upon payroll, and because the volunteer payroll by definition is zero, adding the volunteers does not cost them anything. In addition, it creates the same “exclusive remedy” path for volunteers that exists for regular employees, so injured volunteers cannot bring suit against the university for work-related injuries. Even though volunteers do not make any money, if they suffer serious injuries in the “course and scope” of their volunteer efforts, they may try to assign a dollar value to the services, in order to come up with an indemnity payment. This is an issue that many hospitals — with their huge cadres of volunteers — must face from time to time. Our Wisconsin saga does not involve comp coverage for the volunteer (although she may opt to file a comp stress claim, after all she has gone through!). What’s at stake is liability for the actions of a volunteer. In this case, the insurance policies appear to explicitly include volunteers. In any event, I would surmise that the same issues arise here as with independent contractors: who controls the work? If the employer controls how the volunteer work is carried out, I expect that liability will follow. In the case of the Wisconsin church, you could argue that they have an obligation to check the driving records of any volunteer who drives as part of their donated work. This is a can of worms, indeed! One of the best summaries of the issues for churches can be found at a United Church of Christ website. In the meantime, institutions relying on the services of volunteers to carry out their work should keep in mind the first law of capitalism: there is no such thing as a free lunch. It’s the weekend, so we couldn’t resist bringing you this rather unusual story of two fired employees, a gorilla, and a million dollar employment lawsuit. We would like to think employers don’t need to be told these things, but apparently some people need things spelled out in some detail: it’s not a good idea to ask your employees to disrobe in front of the gorillas. No, not even when the gorilla in question is celebrity “talking” ape Koko. In fact, unless you can prove that it is an essential function of the job, it’s generally a bad idea to ask your employees to disrobe in front of anyone, beast or otherwise. And another pointer. OSHA takes a dim view of things when you store gorilla urine in the same refrigerator where your employees keep their lunches. There are probably other lessons in this story as well, but those seem to be the two big take-aways. A proliferation of premium fraud? 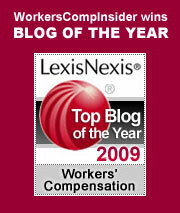 You know that workers comp is a problem when the so-called mainstream media begin to take note. Normally, workers comp is a topic relegated to the trade journals or the deepest nooks and crannies of the business pages in the daily news. Contrast this with the early 1990s, when headlines screamed about runaway costs and story after story included tales of employers closing shop or moving operations from one state to another due to the burdens of workers compensation. This month, Forbes features a story about current workers comp woes, and it is interesting to note that this story entitled Workers Con deals primarily with the proliferation of premium fraud. Is employer fraud actually more widespread in reaction to rising costs, or are state regulators just taking a harder look now that reforms have wrung the fat out of other aspects of the system? Hard to say for sure since fraud statistics – both on the employer and the employee side – are often difficult to quantify and generally rather squishy at best. The Forbes article says yes, if the rising number of suits filed by state and private insurers is an indicator. One thing is for sure – fraud schemes hurt us all: the injured employee is often left without recourse or forced to bring suit to pay for medical care; the honest employer pays higher premiums as insurer costs “trickle down.” In addition, fradulent employers often enjoy an unfair competitive edge. By illegally evafing a cost of business tht can be substantial, fraud perpetrators can offer lower prices in competitve or bidding situations. Employers that hire contract workers through a third party, such as through a temp agency, or a leasing company, and employers who purchase workers comp packaged in a bundle of other services, such as in a PEO, need to be particularly alert to the issue of coverage lest they find themselves holding the bag. The California Department of Industrial Relations offers an employer tip sheet on ensuring the legitimacy of workers comp coverage. It is worth kicking the tires before cementing any arrangements: check business licenses and verify coverage with a local insurance authority. Posted in Insurance & Insurers | Comments Off on A proliferation of premium fraud? Well, not really. But have you ever really examined how your company is viewed by an insurance underwriter? Conventional underwriting is primarily a look in the rearview mirror: the assumption is that companies with low historical losses will have low losses going forward. I don’t think it’s quite that simple. In an article written for the Journal of Workers Compensation, I take a look at underwriting from two perspectives: the conventional approach, and a decidedly “out of the box” look at the best indicators of danger ahead. A masonry contractor with a relatively clean loss runs and a low experience mod appears to be a great risk. However, the business is so successful they double the workforce in less than two years. It turns out that they have trouble finding good people. They hire strangers who transform the work culture. Their losses go through the roof and their insurer is left holding the bag. Conventional underwriting was unable to detect the problems ahead. A small manufacturing company has a clean loss history, but the average age of their workers is in the mid-50’s. Many of the workers have over 15 years with the company. Is it a good risk? I would be concerned about the lack of transferable skills among the workers, along with the propensity for older bodies to break down. Show me a production line worker with 15 year’s experience and I’ll show you an MRI full of red flags. I would want to know details of the work culture, the proposed hiring and the ergonomics of this workplace before I made any final underwriting decisions. What matters most in determining relative risk certainly includes but is by no means limited to past performance. I like to know what’s ahead. Any company planning to expand or reduce their workforce might be a marginal risk. In the article I explore some of the factors that seem to be the best prognosticators for success. Your feedback — indeed, the feedback of our readers who are directly involved in underwriting — is most welcome. Posted in Insurance & Insurers | Comments Off on Underwriting for Dummies? The New York Attorney General’s office is expanding its inquiries to encompass managed care practices. At Managed Care Matters, Joe Paduda reports that Concentra has received a subpoena. In his post, Joe discusses some industry practices that might be under scrutiny, although he rightfully notes that this is not to infer that Concentra engages in such practices � Concentra may simply be a target of inquiry because it is the largest workers compensation managed care firm. Roberto Ceniceros of Business Insurance reports on a ruling by Florida�s 5th District Court of Appeal that extends the exclusive remedy principle to third party administrators (TPAs). Essentially, exclusive remedy means that in exchange for providing timely medical and wage replacement benefits to any employees injured at work, the employer will be free from suit. Barring some few exceptions such as in cases of employer misconduct, workers comp is the sole or exclusive remedy for the injured worker. In Protegrity Services Inc. v. Theresa Brehm (PDF), the court noted that immunity from suit is an essential element of the workers’ compensation system, and extended the same immunity that an employer or insurer would be afforded to the TPA. Diane Pfadenhauer at Strategic HR Lawyer points us to State Health Facts, a great resource hosted by the Kaiser Family Foundation. The site provides data on more than 450 health topics. It includes a 50-state comparison of demographic, economic, and health-care information. Are you planning to attend the RIMS 2005 Annual Conference in Philadelphia from April 17-21? If so, you only have a few days left for a discounted registration rate. The early bird cut-off date is February 18. There’s been a lot of publicity lately about private disability insurance. Most of it’s negative, stories about insurance companies denying coverage or making claimants wait a long time to collect benefits. A typical article recently appeared in the New York Times (available by subscription only). As I think about it, writing disability insurance — especially “own occupation” policies which cover people who can no longer perform their current jobs — is risky business indeed. Workers compensation is disability coverage for work-related injury and illness. In virtually all states, you are covered if you cannot work. If you can return to any productive employment — whether or not you can return to your original occupation — your indemnity benefits are reduced or eliminated. Indeed, in some states, if you have an “earnings capacity,” your indemnity benefits can be reduced — even if you are out of work. If you need training in order to find work within your permanent, work-related restrictions, you participate (sometimes involuntarily) in your state’s vocational rehabilitation program. Perhaps because of the years of training required to become a professional, private disability insurance is common in the medical field. There are websites devoted to the preservation of income for doctors. Under “own occ” coverage policies, a surgeon who can no longer perform surgery could collect a substantial amount of money for many years, depending upon how the policy is worded. The fact that this highly skilled individual has transferable skills that might lead him or her to become a fabulous administrator has no bearing on eligibility for benefits. For whatever reason, if the doctor cannot perform as a surgeon, his or her disability income for life is assured. I am not questioning why a doctor would want this coverage. It makes sense. Heck, it makes sense not only for doctors, but for anyone who goes through extensive training to take on professional responsibilities. My question is on the other side: who would want to take on this risk transfer? Who would want to write this kind of business? How would you underwrite a policy where the potential payouts are huge, the definition of disability is exceptionally broad and the premiums relatively small? I am suggesting that the risks of writing “own occ” coverage are too open-ended for my tastes. It seems based upon the peculiar premise that we were put on this earth to do one specific thing only. “Any occ” coverage seems more sensible: if I am disabled from working, I collect benefits. If I can return to some productive work, these benefits are reduced or eliminated. The goal should be to keep people active and productive. Under “own occ” policies, we actually encourage disability, by limiting our vision of what people can and should be doing in the world of work.